Motorized vehicle emissions are a primary cause of air pollution and yield some of the most adverse impacts on public health. According to the World Health Organization (WHO), exposure to heavy traffic—even living near a major road—harms health and increases mortality rates. In 2012 alone, outdoor air pollution caused 3.7 million premature deaths worldwide, 88 percent of which occurred in low and middle-income countries. In response, pedestrianization projects in cities worldwide are demonstrating that transforming car-oriented streets into walkable environments can generate a range of benefits—from higher levels of physical activity to greater economic activity. Istanbul, for example, has been a leader for pedestrianized communities and is demonstrating that making streets about people—not cars—can produce concrete benefits for all. The Historic Peninsula, one of Istanbul’s most iconic districts and a UNESCO World Heritage Site, is the heart of commerce and tourism in the city. Attracting approximately 2.5 million visitors on a daily basis, the Historic Peninsula’s heavily trafficked area was no exception to Istanbul’s car-centric design trend. In a study of the area, UNESCO documented how poor transport infrastructure and intense air pollution were causing damage to the monuments and designated historical sites. In 2005, the Istanbul Metropolitan Municipality took action. Launching the first pedestrianization project in the region, decision makers aimed to reduce the impacts of vehicle traffic on the local community. 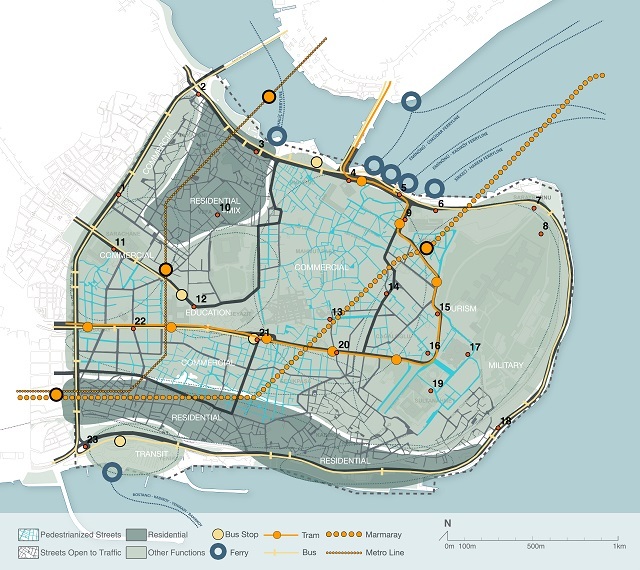 Five years later, a report from EMBARQ Turkey entitled “İstanbul Historic Peninsula Pedestrianization Project- Current State Assessment” examined the Penınsula’s intense traffic and offered recommendations for improving its social and economic structure, accessibility, road safety, and environmental quality. Respondents predominantly stated that disturbances caused by motorized vehicles and vehicle noise decreased significantly after pedestrianization. There was a mix of responses on the reduction of pollutants; 61 percent of employees or business owners reported a decrease in air pollution, while only 52 percent of residents thought that air quality had improved. As a whole, however, the surveys show an overall satisfaction rate of 80 percent among residents, students, employees and business owners. Riding on these results, the Historic Peninsula has pedestrianized 295 streets since 2010, making the region a vital transport hub for Istanbul’s citizens. Thanks to the recent pedestrianization efforts in the Historic Peninsula, vehicle emissions and pollution levels have come down significantly. A new report titled “Assessment of the Air Quality Effects of Pedestrianization on Istanbul’s Historic Peninsula” from EMBARQ Turkey analyses the impacts of pedestrianization on local air quality in Istanbul. Records indicate that harmful gases, such as NO2 (Nitrogen Dioxide) and SO2 (Sulfur Dioxide) decreased significantly after pedestrianization efforts. Other general traffic-related emissions have also declined considerably at the tip of the Historic Peninsula, in Sultanahmet, and along transit stations closed to vehicles. Meanwhile, the residential area in the Northeast of the Historic Peninsula—which has not been pedestrianized—has experienced little or no reduction in traffic-related emissions, demonstrating clearly the effect of pedestrianization on local air quality. A comprehensive, long-term transport plan should be prepared that establishes a congestion charging program in the Historic Peninsula. Once constructed, the program will create a low-emissions zone to regulate traffic entering the peninsula. Improve enforcement of existing provisions to ensure that pedestrianized streets remain pedestrian-friendly. Traffic calming measures should be complemented by an integrated and efficient mass transport system with a high carrying capacity. travel modes, such as mass transport or walking. The benefits of these recommendations are not limited to air quality. These measures can reduce noise pollution and create additional advantages, such as improved pedestrian safety, transport access, and quality of life. 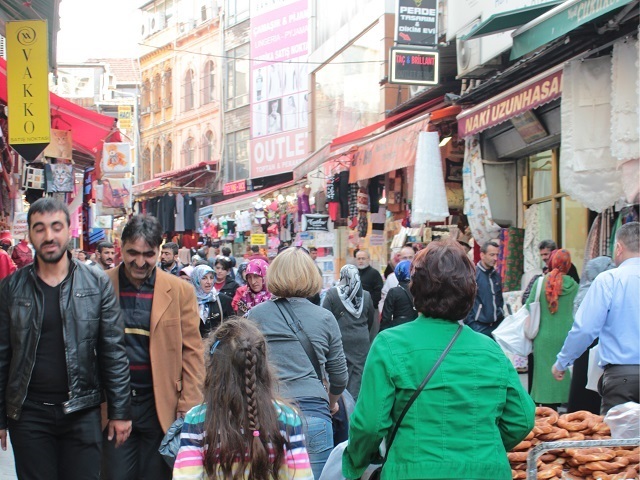 It’s critical that city leaders in Istanbul and beyond recognize the success that pedestrianization can have on urban communities and continue to support walkable, people-oriented streets. To read the report and learn more about the effect of pedestrianization on Istanbul’s Historic Peninsula, click here.